What will 2018 hay prices look like? This is always on the Top 10 question list this time of year. To be honest, it won’t be answered here because there’s still a multitude of unknowns that are . . . well . . . unknown. What can be done is to examine what we do know and take a look at some of the factors that will help push prices up or down from their previous levels. From that point, I’ll take my guess. Here are a few thoughts. Mark January 12 on the calendar. That’s when USDA will report its December 1 hay stocks tally. This number has gone up the past four years, but last year the rise was modest compared to the previous three. December 1 stocks will offer a good starting point of how well the market will withstand any hitches in the giddyup. The report doesn’t differentiate based on forage quality. Even in years when stocks are strong, Supreme and Premium quality can remain in short supply. That situation is already known to be true in some parts of the United States as a large price gap is developing between the high and lower quality forages. In 2016, harvested hay acres were down 1.1 million acres from 2015. Forecasted acres for 2017 stand at 53.5 million, similar to 2016. USDA’s Annual Crop Production report on January 12 will offer a final number on harvested hay acres as well as production. We’ll also need to watch planting intentions next spring. Hay exports continue to strengthen, with China leading the surge. That country will import over 1 million metric tons of U.S. alfalfa during 2017. Total U.S. alfalfa exports through October were up over 11 percent from 2016. In addition to China, alfalfa hay exports to Japan, Saudi Arabia, and South Korea are all higher compared to last year. As was reported last week, Saudi Arabia will be looking to boost their import total as its government is turning off the water spigot for domestic alfalfa production. Though exports make up less than 5 percent of the total U.S. production, that percentage is much higher when only the Western states are considered. Further, 10 years ago, the percentage of U.S. alfalfa hay exported was only 1.5 percent. The export market is definitely a competitor with domestic markets, especially in the West. It also acts as a destination for hay that would otherwise have to find a home in the U.S. or wouldn’t be produced at all. I think we can safely put exports in the category of supporting higher hay prices, especially in the West. The nation’s dairy herd was 53,000 cows larger in November 2017 than it was the previous year. Year-over-year milk production has been higher in every month except one (February) during 2017. Milk prices in 2017 were higher than 2016, but still at levels that are barely profitable or worse. Unfortunately, market experts are not painting a rosy milk price picture for 2018, especially during the first half of the year. The average milk price in 2018 could easily be below 2017. Those dairies that purchase hay may be less inclined to pay top dollar through winter. The ones producing their own forage generally have good supplies. The U.S. beef cow inventory was 32.5 million on July 1, 2017; that’s nearly back to levels of 10 years ago and up from a low of 29.1 million in January 2014. Most experts feel the herd will continue to expand in 2017, but at a lower rate than 2016. Beef prices have been better than expected even with the herd expansion. Bottom line: More animals continue to be fed each year, meaning a higher demand for hay or more hay acres. Corn and soybeans continue their sideways price trends at levels often below the cost of production. As competitive livestock feeds, it’s unrealistic to think that hay prices will return to extremely high levels until strength returns to the grain commodities. This has the dual effect of also taking existing hay acres out of production and tightening supplies. Short of some major weather phenomena, it’s unlikely that grain markets will move drastically in 2018. The biggest wild card remains weather conditions, beginning with the annual chance for alfalfa winterkill in Northern regions. Drought, persistent rains, and wildfires seem to be annual events these days, but usually are localized events with little impact on national hay price movement. However, a drought of the magnitude and scope of 2012 can change the entire picture. Of course, none of this can be predicted at this point. What we can be sure of is that somewhere there will be local hay prices significantly impacted by extreme weather events. The case for higher hay demand and stronger prices can be found in more animals (both dairy and beef) to feed, profitable beef prices, and the strong hay export market. The expectation for lower milk prices and little upside for commodity grain prices are reasons to think that hay prices may not have significant upside potential. Hay prices strengthened in 2017 with high-quality hay selling for $40 or more per ton above 2016 levels. Further, the export timothy hay market was exceptional. Though prices may not retreat significantly in 2018, it’s hard to see a scenario where similar gains are made without a widespread weather-related event. 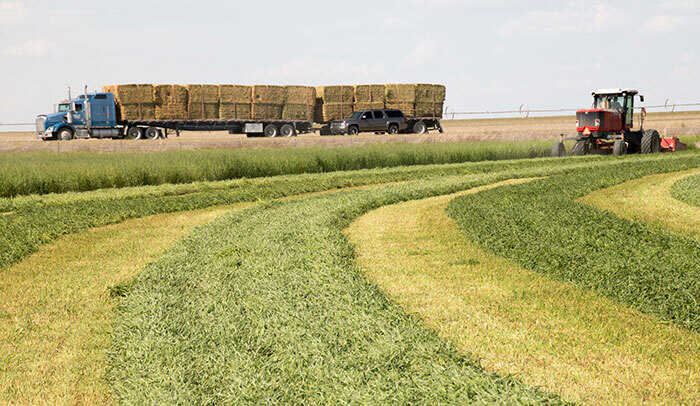 Finally, what seems to be true every year is that high-quality forage brings a premium price and high-yielding forage carries the best profit margin. Combine the two and you’ll nearly always hit the jackpot. Do what you can to first impact your own bottom line, then worry about the hay market.